Started off early at 6:15AM on a Thursday morning. Route plan was Bangalore – Nice Road – Mysore Road – Ramanagara. Breakfast at Kamat Lokaruchi. Took roughly an hour (usual time) to get there. The route from Ramanagar is – Mysore Bypass – Nanjangud – Gundlpet. At Gundlpet, you fork off towards Wayanad/Sultan Battery (the other road goes towards Ooty). After a few miles from Gundlpet, you get into forest territory. Awesome road and scenery all around. Super roads all the way. Took another half hour to get Windflower Resorts. Reached around 1:30PM – right in time for lunch. If you went all the way to Vythiri town, you went too far. There is a town just before it called Chandel Junction. At Chandel, look out for Canara Bank and SBI ATM on the left, and a road that goes down hill right opposite it. The corner is also an auto stand. Easy to miss. You go down the road, or what is called a road for 3.5km. Horrible horrible driveway. Apparently they have not repaired the road because it is under some court stay order. The resort is just fantastic. Isolated. But beautiful. We had booked a villa with a private jacuzzi. Totally enjoyed the room and the resort. Some pictures of the resort below. We went to Pookode lake one of the days, and totally not worth it. Super crowded small (compared to Ooty/Yercaud) lake. There is also a view point on the Kozhikode road that is pretty darned good. But we had to run off quickly. Too many rowdy monkeys demanding stuff from the tourists. There is one other place near by, called Banasura Dam. It is the second largest earthen dam in Asia (largest in India). You can do a speed boat ride (super awesome – my son loved it!) and just get some awesome views of the dam and the Kabini river. We stayed there Thursday and Friday. We were planning to leave Saturday back to Bangalore. But we realized that Kozhikode was just 2 hours away. And the beach beckoned. So we made a flash decision. Was able to snag a room in a beach resort in Kappad beach, which is 20 km from Kozhikode. The resort (Renai Kappad Beach resort) is separated from the beach by just a small road. We did Banasura on Saturday morning, on the way to Kozhikode. Reached Koppad beach by lunch time. Evening was spent on the beach. Super time was had. Back to Bangalore on Sunday morning. Had breakfast in Kozhikode. It is a long ride back to Bangalore. Almost 10 hours including breaks. Lunch was at Gundlpet. There are a couple of decent restaurants just outside of the town. Reached home around 6PM. Well, it has been a long time since I blogged (super busy at work is the excuse this time), and what better than a travelogue to pump up things around here. Technically, the destination is not Chikmagalur per se, it is a coffee estate resort called “The Eagle Eye Holiday Home” about 42 km from Chikmagalur town, on the Malandur Road (for those in the know of all things Western Ghats!). Friday evening – Left Bangalore at 3:05PM – had to pick up the kiddo from school. Surprised (in a bad way) to see so much traffic on NICE road. Had never seen so much traffic on this road before. Trucker traffic mostly. In winter, when it got dark very quickly, our speed kicked several notches lower past Hassan. This is a simple medium cost hotel if you just want to plonk for the night, which was what we did. The road from Chikmagalur to Eagle Eye is just awesome. Highly advisable not to do in the night though. Absolutely no markers, or sign boards anywhere. It is just coffee plantations everywhere and nothing else. It takes a good 1 hour 20 minutes to reach. The last 1.5-2km is a mud-road that leads into the estate. The place is permanently full. So book in advance. We stayed in a villa – which is just a plain large bedroom with an equally large bathroom, and a fantastic sit-out with a view. There are other types of small cottages as well. There are no TVs in the rooms, nor is there room service. The manager lady explained to me that this was very intentional, because, as an eco resort, they want their guests to experience the outdoors. If there is a TV or room service, people rarely get out of their room. The dining area is a fair distance apart from each of the rooms. Beautiful view from the dining area too. Simple buffer breakfast, lunch, and dinner. The tariff is all inclusive. The resort arranges a nice 3km (round trip) trek to a peak inside the estate. It is a moderately intensive trek, but the there of us (including my 7 y/o) was able to do it. The Bhadra National Game Reserve is about 21km away (about 45 minutes drive). We drove down there. The park rangers take you on a park safari. We saw some small game (peacocks, wild boar, langoors, stag, and spotted deer). About 10km away from the resort is a small temple (Markandeya temple) on the banks of the River Bhadra. Very scenic spot. Overall the resort is so serene and full of outdoor activities, that the 2.5 days that we spent over there, flew by at a perfectly acceptable pace. It was neither too fast, nor too slow. One of those holidays that you walk away from, thinking that it was very well spent. If you are one of those, who corrupt your coffee with chicory, then you can buy some powder in the resort itself, but if you are like me, who likes their coffee “pure”, skip it. We drove down to Chikmagalur on Monday morning, right after breakfast. Stop by Panduranga Coffee Works on MG Road in Chikmagalur, if you want some awesome coffee. I bought some roasted beans for our coffee machine at office, and some powder for home. Pure Arabica. Hmmmm. Came back at a good clip back to Bangalore. Chikmagalur to Nelamangala (about 4 hours). Stopped for lunch at Kamat at Chennarayapatna (abbreviated as C.R.Patna everywhere). There is also an A2b right opposite, if that is your taste – but you would need to do a long round about and a U turn if you want to get there). And *sigh*, of course, got stuck in traffic on Hosur Road. Spent almost an hour and a half on that same road. Mostly the roads were good – except for a short stretch from Mysore to Nanjangud – where there is road widening that is happening. Once this is finished, the road should be fully done. I took the Masinagudi route to/from Ooty – this is the 36 hairpin bend short route. The road in this stretch is also awesome. The road inside the Bandipur sanctuary has been freshly laid and is really good. On our way to Ooty, we passed by the Bandipur area around 6PM. Looks like this is a great time to spot animals. Spotted hordes of bison, deer, and peacock. On our way back, the traffic was horrendous. All of Bangalore was returning from the long weekend. Do not miss the wood fired pizza at Nahar Side walk cafe. Their multi-cuisine restaurant – Chandan – is also pretty good. Both are pure vegetarian. The Sterling Elk Hill property has undergone massive renovation and looks super posh inside. They are adding more rooms as well. On the way back, if you want to fill gas, there is a bunk, right at the beginning of the Mysore road (from Ooty). If you want to avoid the maddening crowds of Ooty, and want a relaxing drive, drive down the road towards Kundha/Upper Bhavani. The Emerald lake is just an awesome vista point. If you want to have lunch in Mysore, but do not want to go into the city, there is a Kamat Madhuvan, just near the Mysore bypass. Last weekend, my sister, brother-in-law and their kid visited Bangalore, and we used this as an excuse to visit Nandi Hills (which we had never visited so far in the seven years we have lived in Bangalore!). We started early – around 7:00Am from Koramangala. We took the usual route to the airport that most cabbies take: Viveknagar -> Mother Theresa Road -> Residency Road -> MG Road -> Golf course -> Mekhri circle. As per plan, we took a slight detour off at RT Nagar and had breakfast at the Vasudev Adigas – at 730AM. Left Adigas around 830AM and took to Bellary Road. Road is just awesome. Beautifully paved 6 lane road. Pleasure to drive. But do beware of cops who stand with radar speed detectors and can book you (apparently happens very regularly). 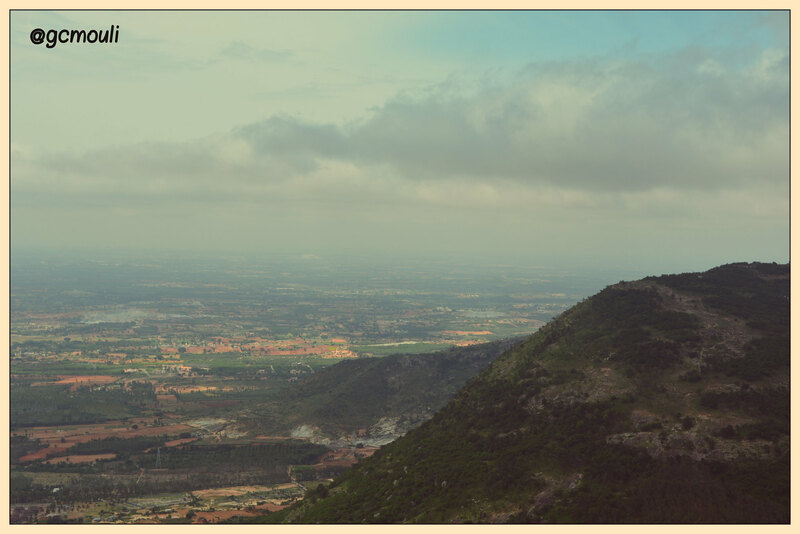 After a while, you will see a board to Nandi hills heading left. You will also see a restaurant complex of sorts in that junction. Do take that road even if your GPS does not say so. My MapMyIndia GPS asked me to go straight on and take the next left. The road quality is super bad in the second route. The Ghat section is a pretty intensive ghat section – not too long, but quite a few hair pin bends. Honk at every turn – because it looks like this ghat section is a favourite for bikers to show off their speed biking skills (especially given that, it is a favourite romantic spot for couples). Once you reach the top of the hill, there are parking areas. The one at the very top apparently gets filled up very quickly and overflows to the lower level, which is where we parked. This is an area under a larger number of trees and some weird tree house type structures with little or no flooring. Interesting observation: 5 of the 10 cars that were parked there were zoomcars. This parking area is just super windy and chill. Do make sure you take a jacket. 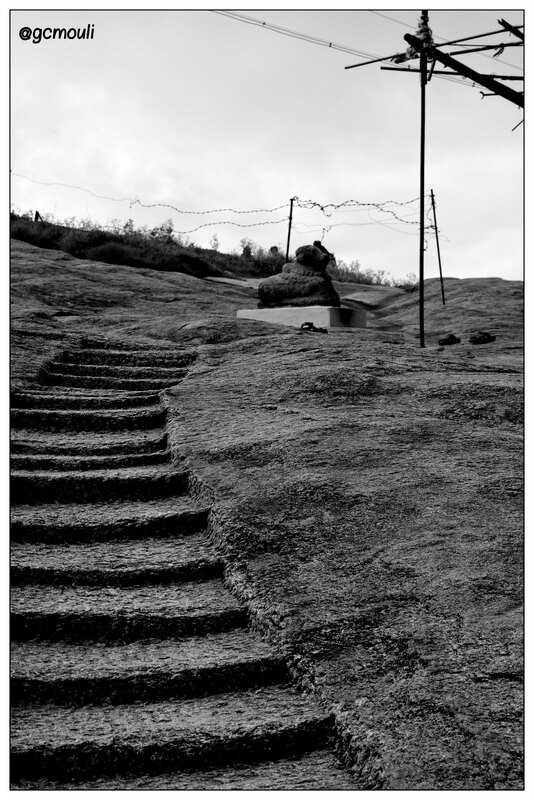 You climb up to the actual Nandi hills area via a little walkway and a few steps. You have a large Shiva temple which looks pretty old. And a Kalyani (temple tank) inside it. This tank is fed by fresh water springs all year long. It is believed that this tank (and its springs) is where three rivers originate – Palaar, Pennaar, and Arkavathi. 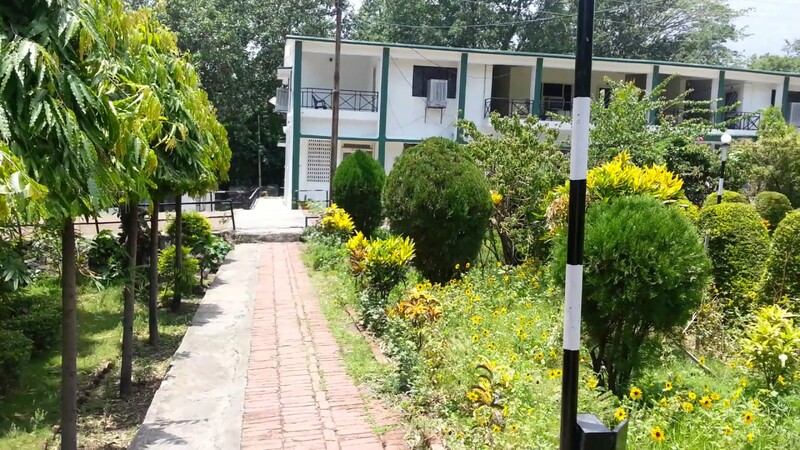 There are some neatly maintained gardens and pathways nearby, where you can take a stroll. The two 5 year olds played a bit of football for a while. There is a Nandini ice cream parlour, where we all had ice creams. There is also a small cafe (small eats like idli, dosa, tea, and coffee are available), where all had tea/coffee. Warning: There are a large number of monkeys. Even if they see you having something resembling food, they will come and grab from your hand. In fact, if you do even so much as to sit on some of the park benches, they think, you are going to eat, and approach you. The monkeys scared the living daylights out of us, and we left in about an hour. Over the course of the half hour, we saw monkeys snatching chips packets from small kids, snatching ice-cream bars from older people’s hands, and such. We left from there around 11am and back in the city by around 1:15pm. It is a good picnic spot – but without food. We missed an old temple at the base of the hills – with two 5 year olds, this is how much we could cover. It is a place that you can visit once – nothing more to do multiple visits – would be boring. Onward: Talaguppa express (16227) from Majestic (SBC) – Pf 9 – AC coaches get added at Bangalore – in the front – next to engine. Reaches Shimoga town (SMET) at around 4:50AM. We had booked a taxi from Sringeri – You can call Sudhakar at +91 94487 23382 if you want to book. Good guy. Understands Kannada and Tamil (potentially English and Hindi too, I did not try). Cost (at the time of this writing) is Rs.2250 for pick-up. For staying at Mutt rooms, check in main reception (the driver will take you there). Lunch and dinner were had at the Mutt. For breakfast and evening tiffin, we frequented Hotel Maruti. This has been there for the last 20 years (second generation family that I am seeing that is running it). Restricted menu items, but guaranteed not to affect your stomach. We did a Hornadu visit from Sringeri and back. Takes 2 hours to get there and 2 hours back. And about an hour for darshan. We took the same cab. Rs.2250 (almost same distance). Return was also using the same cab (Rs. 2250). Though the train is at 10:30PM, we were advised to leave around 6PM so that we can come to Shimoga around 8PM. Dinner places are open (and relatively less crowded at this time). We had dinner at the Mathura Paradise. Decent vegetarian North Indian food. Return train is Talaguppa-Bangalore express (16228). Comes in at Pf 2. Comes in mostly bang on time. AC coaches come coupled. Train stops only for about 5 minutes. Arrives in Bangalore at an unearthly hour at 4:25AM (apparently some times even earlier). There were serviced apartments that started popping up in cities like Bangalore a few years back. These were good alternatives to expensive full service hotels. A lot of frequent IT travelers liked these service apartments, because they were really good quality rooms, and they were inexpensive because they were no-frills. No service. Mostly no restaurants attached. This fit their bill perfectly. But there was a problem. These service apartments were unorganized. You could only book them by calling them by phone. Some of them had a website, but most did not. Discoverability was a problem. This is being solved by a slew of new start-ups like OyoRooms, Ziproom, and stayzilla. Now, allow me to add one more level of complexity into this problem – which could be a potential area where start-ups can spring up. Toiletries – For those who follow me on twitter, you would notice that this is a big peeve of mine. I am not a big business traveler, but I get irritated every time I am put through the “you-cannot-carry-toiletries-in-cabin-baggage’. This is the biggest bummer that happened after 9/11 in the US (which naturally percolated internationally). I would love to not carry toiletries at all during international travel. And you might ask – hey most hotels give you soap and some of them give you paste. I would want my brands to be there – cinthol/dettol soap + vicco tooth paste + fresh new brush + gillete mach3 razor+blade (disposable is fine) + nivea after shave gel. Now, if this is an add-on package to any of the room booking start-ups, I would glad plonk money on it. Travel – What if I can book a day cab or a cab for airport/station pickup or whatever need I have, while booking the room. Would that not be awesome? Sure, again, you might ask me, I could always use Uber/Ola/whatever to get the cabs on demand. But when I am on a business trip, I would like everything to be perfectly planned. I may sound pompous here – but I want my car waiting for me every time I want it. I would not want to be fiddling with my phone and getting a “No cars in your vicinity” message and getting stressed about it. Sure, the hotel could very well book an uber/ola on my behalf – I dont care, but I want it to be waiting for me. Food – What if the hotel can offer me a fixed simple veg meal when I return back to my room at 8:30PM. A simple Mast Kalandar HP2 would be perfectly fine. But I would not want to be the one ordering it on the way back to my hotel, and giving directions, picking it up, paying, and all of that. It would be so much value for money for me to just get into the hotel, my food is waiting ‘hot’ in the reception, for me to take to my room, and have it in peace. Sure, the hotel can tie up with swiggy, mastkalandar, urbanspoon, whatever. They can even ask me where I want the food from. But again, sounding as pompous as I can, I want the food waiting for me, when I get to my room, after a tiring day. Hey they can get fancy too – they can save my preferences, and just confirm if I would like to order the same as last time. I know a lot of travelers do that. You could get fancier, by enabling the service apartment reception to call you once just to confirm if you would be needing dinner (what if – you suddenly get pulled into a client dinner type situation); or perhaps a push notification on your phone. A lot of stuff can be done in this area. Posted on June 25, 2015 November 19, 2015 Categories startup, technology, travelTags cab, food, mastkalandar, oyo, personalization, service apartments, toiletries, travel, ziproom1 Comment on Personalized Hotel Rooms ? This is part 2 of my Summer of 2015 series. Part 1 is here. I had a list of 5 temples to cover this weekend, and was able to succesfully cover them. I do not intend to hurry on this at all. While I am attempting to cover the 276 thevara paadal petra sthalams, 276 is after all a number. My intention is to savour the Thanjavur jilla, the different forms of Lord Shiva, the beautiful Chozha architecture etc. So yeah, no hurry. Saturday morning, I set off on the trusty wagon-R of my brother-in-law. First stop was Konerirajapuram. Take the Kumbakonam Karaikal road. In about 19 km, you will reach a town named S.Pudur. Take a right here and you will see a signage for vadamattam. 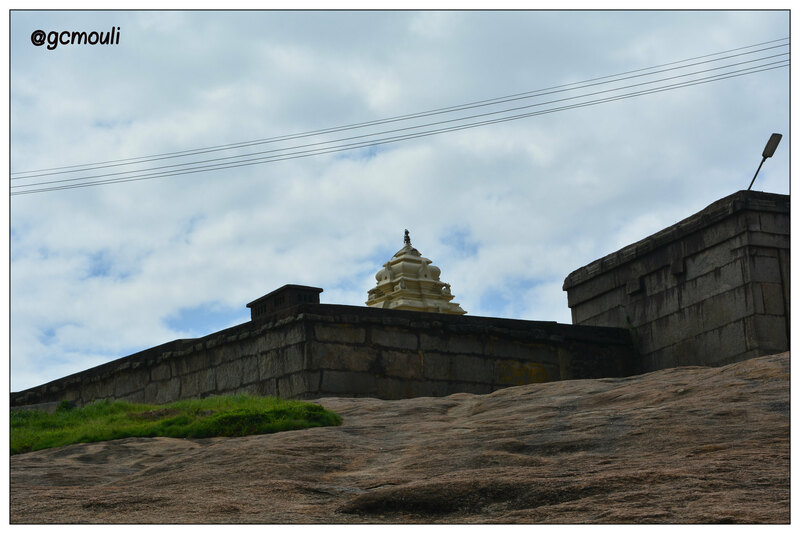 Take the road for another 2km, you will hit the temple tank and you will see the Shivan temple. Legend: The Raja wanted the sculptors to make the largest Nataraja possible. He had said, atleast 6-7 ft. Typically Nataraja is made using a 5 metal alloy called Panchaloham. The sculptors kept trying, but they could reach 2.5ft, 3.5ft, but never more than that. Lord Shiva appears as a thirsty brahmin in front of these frustrated sculptors and asks for water. The irritated sculptors give Lord Shiva a glass of Panchaloham. Shiva drinks this and becomes the 7 foot Nataraja that we see today in the temple. The sculptor gets very psyched and goes and tells the Raja, who refuses to believe this story. He comes and hits the idol using a chisel, and blood starts oozing out. The Raja then begs forgiveness to the Lord and asks how to cure the wound that he has created. Lord Muruga comes in the form of Vaidhyanathar and cures the cut. On the right side of the moolavar sannidhi, there is a Vaidyanathar sannidhi and facing him is Muthukumaraswamy (Muruga). Very quaint little temple. The temple was getting ready for Kumbhabishekam. Another highlight of the visit to this temple was the temple dog, which kept playing with me the entire time I was there. There is also a famous Perumal temple here. I tried going them, but the temple was locked. I could only peek from the doors. I could get a faint glimpse of the Lord only. Next on the list was Vaikal Maadakovil. Maadakovil is a class of temples built mostly by Kochengat Chozhan where he built the main temple on a platform which was about 4-5 above the ground (some of them even higher). This is because of a legend that he was a spider that reborn; and in the legend there is an elephant which kept destroying the spider web. [Read legend here]. So even in the next birth, he is supposed to have hated (or afraid of) elephants, and built most of his temples on a raised platform so that elephants cannot reach the sanctum sanctorum. Anyway, back to Vaikal. The road to here is a bit on the narrow and wild side. The road twists and winds through paddy fields and thick bamboo thickets. I used Google Maps to reach there. You will not find too many people to ask directions to here either. Temples was open. No priest. Apparently the priest comes in the morning, performs puja and leaves. Beautifully peaceful temple. Nice temple pond also. Next on the list for Saturday was Thirukozhambam (earlier called Thirukozhambiyam). Head back to the Kumbakonam-Karaikal Road. There is a new bridge that connects Vaikal with the highway, which Google maps does not know about. I found it by accident. Head back towards S.Pudur. You will pass the right turn that we had earlier taken (to Vadamattam). Right after that, you will see an arch on the left. The arch will say “Sanathkumareswarar”. Head into the arch and head down for about 3-4 km, and you will reach Thirukozhambam. Again, no priest. Temple was open. Went in, had darshan and came out. It has a become a popular joke with my father-in-law. 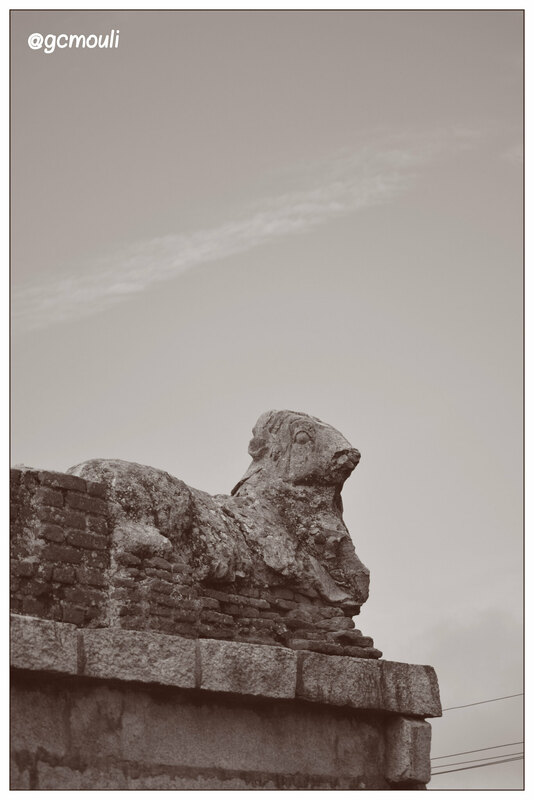 Every time I head back home, he asks me, if there were any other people other than me, in any of the temples I had gone to, and the answer usually is no. On the way back, I saw the Sanathkumareswarar temple. Seemed to be well maintained, and I also remembered the arch. So I went in. We, Indians have a penchant for wealth, Gods, and Gods who help us create wealth. This temple proof. The legend is that Kubera (the God of wealth) had been cursed by a sage, and had lost everything. He came here and prayed to the Shivan here (Sanathkumareswarar) and he regained back his wealth. This makes the temple ‘famous’. There is also an interesting story about the Guru (Dakshinamoorthy) sannidhi at the back. He has 6 raashis on his left thigh and 6 on his right (you can see the engravings). Apparently, if you come here for 12 thursdays in a row, God will grant whatever you were praying for. The priest here told me that this shrine is famous even among Christians and Muslims. After that I headed home. Total time ~ 3 hours. Sunday morning – I had two nearby temples. Started around 930AM. First temple was Kottaiyur. Shivan is called Kodeeswaran. Simple small temple. The priest was there in the Ambal sannidhi only. To reach here, cross the kaveri, using the new bridge (the old bridge is closed for construction now). Once you cross the river, you will hit SH66. Head towards Swami malai. You will cross Melakaveri first and then you will hit Kottaiyur. Next on my list was Innambur. To reach here, continue for about 3 km on SH 66 towards Swamimalai. You will see signage for Innambur. You can either take the right towards Thiruppurambiyam and then left into Innambur, or head a little forward for signage directly to Innambur. Very nice Shiva temple. Two devis – one with a very traditional tamizh name (Sugandha Kundalaambal) and one with a very trendy modern name (Nitya Kalyani). Both these temples took around one hour only. To see the full beauty of the Thanjavur jilla, you need to hit the back roads. The scenery on the side of the highways do not depict the true reality. For instance SH66 scenery is drab. Once you take the road towards Innambur or Thiruppurambiyam, it will blow your mind. Lush green fields. Lone palm trees. Small temples in the middle of the field. Canals. The works.